Over these past 3 days I have been struck by some of the differences between our two earthly homes, Uganda and America. I thought I would just mention a few of the things that have crossed my mind or that Ezra has mentioned. On the plane, Ezra found the milk in his airplane meal that is usually used for coffee or tea. He asked if he could drink it and I said yes. Then he asked what kind of milk is it. Is it from powder? From a cow? Has it been boiled? Can I just drink it? As we stood in line for immigration in Atlanta, I found myself wanting to talk with anyone who looked African. I also realized that I have not seen anyone in short shorts in 6 months. It is a bit shocking to see someone's thigh. Tonight Ezra was really tired and he started to fall asleep on the couch. I thought, "He can't sleep there; he needs to be under a mosquito net. Oh, we don't need mosquito nets here." Every time I set some kind of food on the counter I think, "I need to put that in something or the ants will get to it." But there are not a gazillion ants in the kitchen here in Georgia. Ezra wanted to watch TV and his first question was, "Is the power on?" To go anywhere here in Georgia, we get into the car. Now that we are living on campus at GSF, we walk to work, walk to friends houses, and walk to church. We only drive when we go into town (Jinja). Every time I am driving and I have to turn, I think, "Now which side of the road should I drive on?" I also reach to the wrong side of the steering wheel for the turn signal. So if you see a red minivan in the Athens, GA area, you may want to steer clear. Every time we are preparing to go anywhere, I always use the bathroom first. It has become a habit since most places in Uganda only have a hole in the ground for a latrine. In the US, I don't even have to carry my own toilet paper! As I laid in bed awake at 3am due to jet lag, I thought, "This one bedroom is actually larger than many of my Ugandan friends' whole homes." Tomorrow, or today their time, David and Elijah are helping build the latrine for the church. Tomorrow I am going to a friend's house to sit on a comfortable couch and visit while Ezra plays with his friend. On Saturday morning in Uganda, Elijah was climbing trees and picking 60 avocados for the house moms at GSF. On Sunday morning here in Georgia, Ezra and I drove to Dunkin Donuts for breakfast. The Ugandan option is healthier, but Dunkin Donuts sure is delicious! Today I uploaded photos to Shutterfly in a matter of minutes. It would have taken days to upload all these photos in Uganda. In church on Sunday here in Georgia, I was the only one to say, "Amen," aloud. There was no dancing or clapping or translators and the service was over in one hour. We also sang songs I know well. Right now my family in Uganda does not have electricity, but I am in a room with three lamps, all turned on. For dinner tonight we just decided what we wanted to get, and 30 minutes later we were sitting at the restaurant eating. David planned what he and the kids would eat for dinner in the morning, had the pizza dough made from scratch, and then he made pizzas for dinner. Although these are all differences between the cultures, I have found some similarities. One similarity is that kids in Uganda, in London, England and in Georgia all like to play Legos. 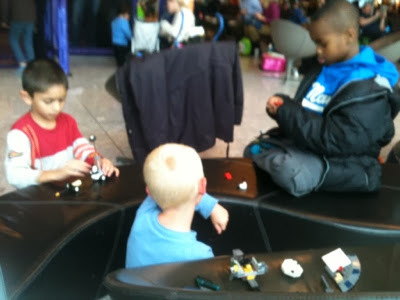 Here is Ezra making friends by sharing his Legos during our layover. It is amazing how different these two worlds are. God is teaching us to depend on him more through all of these differences. I am thankful that no matter where we are He is faithful and watching over his children. These cultural differences help me remember that God loves us, not because we have it all figured out, but because of Jesus! Lisa, I think that we Americans would benefit greatly from your perspective on life. I know I do. Thanks for sharing.